Mumbai Cosmetic Dentist,Dental treatment,Dental Implant Dentist,Dental cosmetic centre, Mumbai Cosmetic Dentist. "Cleanliness is next to Godliness" and we at Dr. Turners'cannot exhort and agree more on this. All our Dental offices adhere to all the guidelines of ISO 9001:2000 which is the most stringent body governing today. All our dental offices are certified ISO 9001:2000 and accredited with this international body. Some of the things we do in our dental office to ensure your safety and well being. Autoclave: (High pressure, high temperature, steam steriliser) is checked by our vigilant team monthly, to ensure proper temperatures and pressures are reached to kill all bacterias and viruses. 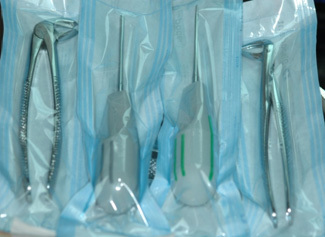 All our dental instruments are first cleaned, washed with antiseptic detergents.Then theay are sent into vigorous high intensity ultrasonic cyles (BIOSONIC) to ensure complete decontamination. After this they are individually packed into sterile plastic pouches. These are then transferred in for autoclave sterilisation. This way we have made sure they have remained untouched by human hand. By following these above steps we maintain the sanctity and safety of our patients. Disinfectants are run through our water lines every week to keep them absolutely free of contaminants. All our staff (para dental) wear sterilised plastic apron before every new patient which is disposed after that appointment. 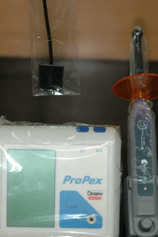 All our dental equipments (digital sensors for xrays /Curing light tips) have plastic disposable sleeves that are mandatorily disposed after each and every patient.